Traveling by train is one of the best ways to see Italy – from the rugged Dolomites to the sparkling waters of the Amalfi Coast. Besides avoiding the stress of highway driving or spending hours going around in circles looking for a parking space, on a train you can sit back and relax while watching the gorgeous Italian countryside go by. Trenitalia, the national train service, used to be the only game in town. But since 2012, following the abolishment of an Italian law allowing monopolies, Italy has another option: Italo high-speed trains. Italo is a privately owned and operated, high-speed rail company that connects passengers to about 20 cities across Italy. 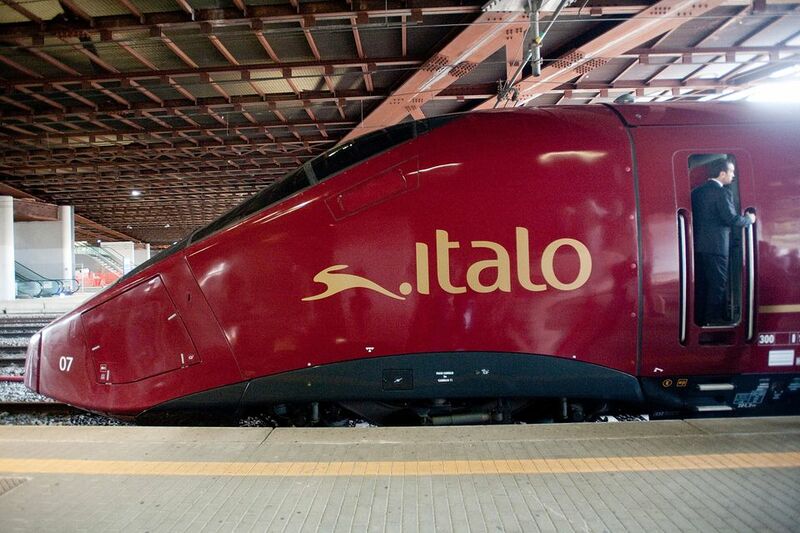 Italo state-of-the-art trains are fast (traveling at speeds of up to 360 km an hour ). Its distinctive burgundy-colored train cars that are aerodynamic, stylish, modern, and well designed for optimum comfort. Special features include large picture windows, reclining leather seats with headrests, TV screens, air-conditioning, and free Wi-Fi. Some say the enthusiasm and popularity that Italo enjoys has forced Trenitalia to improve its services and undergo upgrades, especially on its high-speed Frecciarossa line. Below, we look at some pros and cons of traveling with Italo vs. Frecciarossa. Frecciarossa (the fastest Trenitalia train) shows its scheduled travel time from Roma Termini to Florence Santa Maria Novella as 1 hour, 31 minutes. From Rome Termini to Milan's Central station is listed as 2 hours, 59 minutes non-stop or 3 hours, 20 minutes with stops. Italo has fast, newly built trains with lots of free amenities. Italo's prices are competitive, and often cheaper than Frecciarossa, especially if they're running a sale. Italo offers dedicated customer service and ticket counters at stations. Italo is adding new destinations all the time. As of 2018, routes have been expanded to serve Venice, Padua, Milan, Turin, Bologna, Florence, Rome, Naples, Salerno, Ancona, and Reggio Emilia. Onboard staff is friendly and multilingual. Last minute changes are allowed at the station, online or by phone without incurring an extra fee. Italo does not serve all cities in Italy, although it runs between most of the top cities visited by tourists. Italo does not always depart from central railway stations in the city centers, so depending on where you're staying, it could make catching a train inconvenient. Italo does not connect to smaller cities, while Trenitalia provides regional and intercity service to the far reaches of Italy – from the top of the boot to the heel. We have experienced, and heard other travelers complain about slow or non-existent WiFi on some Italo trains, though free WiFi is one of its featured amenities. There are four classes of service available on Italo coaches: Smart (economy), Comfort (economy with extra room), Prima (first), and Club Executive (luxury). Each class of service offers amenities such as spacious cars, an optional cinema section with personal touch-screen TVs, Illy espresso, drinks, and snack vending machines, and luggage racks for storing your bags. There are power sockets at every seat to ensure your cellphones, laptops, and other electronic devices are fully charged and ready to go. Prima and Club Executive classes are outfitted with Poltrona Frau leather recliners, and add Fast Track privileges, welcome coffee/snack service, complimentary newspapers and magazines, dedicated catering at your seat, and free station club lounge access. Along with train travel perks, Italo offers a range of services to make your entire journey a breeze, partnering with ferry companies, taxi and parking apps, airport transfer and rental car companies, and hotel booking sites. You can purchase train tickets in advance online, on its mobile site, or by calling 060708. On the day of travel, you can also buy tickets at the station from one of their 9 ticket offices or at self-service ticket machines. Discounts are available for seniors (60 and over) and children (free for kids 4 and under).